You know, when a film like this has the title Duck Duck Goose, are you really going in with high expectations? Okay, it was never going to offer Pixar-level quality in writing, jokes or even animation, but that title seriously did not do it any favours, regardless of however the movie turned out. Aside from being obviously named after the children’s game that nobody older than ten years old plays (and yes, they do namedrop it in the actual film), it is a very awkward title to say whilst trying to maintain any sense of dignity – you can probably imagine the feeling of embarrassment clouding over me as soon as I walked up to the ticket counter and said, with the straightest of faces, “one for Duck Duck Goose, please”, to my everlasting shame. It also got me thinking about how every part of this situation was ridiculous: there I was, a grown man in his mid-twenties, on his own, sat in a cinema surrounded by young children and their dragged-along parents (who I assumed were only there because all the showings for Peter Rabbit were sold out), watching a movie called Duck Duck Goose, and realising that this movie was everything I had expected it to be, for better or for worse – but largely the latter. The film is actually an American and Chinese co-production, and is even set in China itself – honestly, it makes very little difference as to why it’s set there, but I guess that was one of the conditions of this becoming an actual thing at all. Anyway, the main character is a goose named Peng (voiced by comedian Jim Gaffigan), a self-assured loner who refuses to fall in line with his flock, which proves problematic when they all migrate for the winter without him, and he breaks his wing in an accident. To make matters worse for him, a young pair of ducklings, Chi and Chao (Zendaya and Lance Lim, respectively), have gotten separated from their own flock and have turned to Peng for help to get them back to where they need to be. Along the way, they learn life lessons about family and looking out for each other and all that stuff you’re probably numb to by this point in animated movies like this. I went in to this expecting nothing more than a cookie-cutter animated movie with celebrity voices – among the cast are Stephen Fry, Craig Ferguson, and most randomly Jennifer Grey aka Baby from Dirty Dancing who turns up as a chicken at one point (talk about a weird career) – as well as tons of co-ordinated slapstick and lots and lots of fart humour, and believe I got exactly what I thought I was going to get. This is about as generic a plot as you would expect for a film like this, with virtually no surprises or real investment to it at all, and with characters who have no originality or any sense of charm to them. His character aside, who can be pretty intolerable at times, Gaffigan’s voice just doesn’t sound right coming out of this goose lead, as from the audio it’s hard to tell whether he was actually trying or he was genuinely bored in the recording studio; either way, there was something about his tone of voice that felt mismatched with this character, and it could have benefited from someone who could do this kind of sardonic voice much better, like Jason Sudeikis or Seth Rogen. There’s really not much else to say about it, which must make this a very dull review for you to read, but I’m sorry; this movie honestly doesn’t have many things I can pick apart, and there’s not a whole lot I can say about it that hasn’t been said already for the numerous other Pixar wannabes I’ve reviewed in the past, namely that it’s a stock and clichéd plot filled with lame puns and fart jokes, although the animation isn’t bad for what little budget they were clearly working from (at least compared to bigger players like Pixar or DreamWorks). It gave me exactly what I was expecting, nothing more, nothing less, and there’s a high chance that I will struggle to even remember this film a week from now, it left that little of an impact on me. 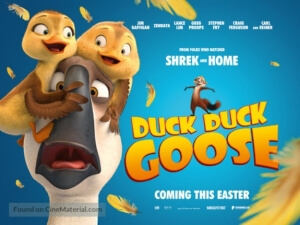 There are movies you expect to be bad that turn out to be every bit as forgettable as you had predicted, and in the case of Duck Duck Goose not only did it turn that way but even in writing this review I’m already forgetting that I sat through this movie. It really is nothing to honk about. Duck Duck Goose is probably just as uninspired and forgettable as you were expecting, with its cookie-cutter stock plot and characters contributing to something you’ll struggle to remember shortly after seeing it.